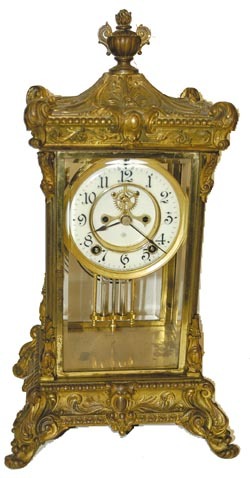 Ansonia Clock Company crystal regulator, "Elysian", C. 1914. Case was made with a rich gold finish of which 90% of it has disappeared. It stands 16.5" high, complete and original with a nice 2 tube imitation mercury pendulum, 2 piece porcelain dial, open escapement, 4 great beveled glasses. The 8 day movement has been cleaned, serviced, and it just keeps on running. This would be an awfully nice clock is you will regilt, or put some kind of finish on the metal. Our minimum reflects that you will have to spend a little to put it back in good condition. Would be $650-$750 if finish was better. Ly-Ansonia #360.